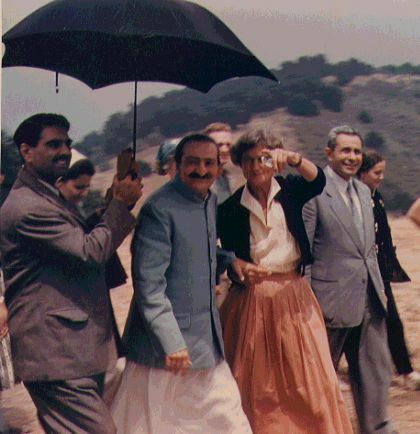 AVATAR MEHER BABA at Meher Mount on August 2, 1956, with caretaker Agnes Baron and close disciple Eruch Jessawalla. On the first Saturday in August, there is always a celebration of the anniversary of Avatar Meher Baba's 1956 visit to Meher Mount. This year's special guest speaker is Hardeep Hanspal who met Avatar Meher Baba in 1962. He also was with Meher Baba in 1963, 1965 and 1969. He and his wife, Indra, currently reside in Meherabad, India, and are very active in taking care of Meher Baba's Tomb Shrine or Samadhi. All are welcome. There is a suggested donation of $20 to help cover expenses. HARDEEP HANSPAL, with his wife INDRA, will shares stories of meeting Avatar Meher Baba. In November 1962, “I had beloved Baba’s darshan at the East-West Gathering and found my God in the form and name of Meher Baba.” After that, Hardeep had the opportunity to again meet Meher Baba for His Darshan in 1963, 1965 and 1969. Hardeep visited Meherabad (where Meher Baba’s Tomb Shrine or Samadhi is located) and Meherazad (Meher Baba’s last home in India), for the first time in 1965 with a small group from Pune with Meher Baba’s permission. In 1971, Hardeep married Indra, and they have two children, son Sujit and daughter Kirti, both married to American Baba lovers, who live in North Carolina. Indra became a Baba Lover after her first visit to Meherabad in 1976. They both do various duties for the Avatar Meher Baba Perpetual Public Charitable Trust. Hardeep is the Samadhi Hill supervisor, and both of them are involved in cleaning, maintenance and management of Meher Baba’s Samadhi area. They also help provide food to the pilgrims in Hostel D at Meherabad, and Indra attends to the laundry at the Meher Pilgrim Center in Meherabad. Please arrive at the restaurant by 5:15 p.m. Seating is limited. Later, you might not get served. Please bring cash or your checkbook. Boccali's does not accept credit cards. With such a large group, there are no separate checks. The total bill - including tax and a 20% tip - is divided by all participants. Each person pays that portion of the bill. RSVP to Sam Ervin if you are attending the dinner. The dinner is a delightful time of fellowship and relaxation after a Meher Baba-filled day at Meher Mount. A dish or beverages to contribute to the potluck lunch. Your food should be ready to eat and not require additional prep or cooking. Plates, cups, and eating utensils will be provided. A hat, sunscreen and water are recommended. There is a suggested donation of $20 to help cover the costs of the event. The weather will be warm and beautiful. The Anniversary is a wonderful time to remember and celebrate the presence of the Avatar of the Age at Meher Mount. There are no fires, incense or candles. The fire danger is extremely high. For more information, see the Visitor Guidelines. If you are traveling to Ojai from out of the area, there are a number of places to stay in nearby Ojai, Santa Paula and Ventura. See more information about the area. "The Fruit Salad Story - Bunty Bernstein and Meher Baba's Visit to Meher Mount"
"The Los Angeles Times Interviews Meher Baba - 1956"